A two-day international conference funded by the Terra Foundation for American Art, in conjunction with the Centre for American Studies at the University of Kent and the Départment d’Etudes Anglophones at the University of Strasbourg. This two day conference, organised by Monica Manolescu (University of Strasbourg) and Will Norman (University of Kent), investigates spatial representations and practices in postwar US literature and art, and their intersection with mapping. We are particularly interested in the ways in which American space is constructed, imagined, reconfigured, displaced, and questioned in writing and in artistic form. The conference will examine the specificity of the literary and artistic appropriation of cartographic tropes, as well as the possible points of convergence and divergence of literature and art in relation to mapping and the material culture of mapping. Art and literature have rarely been treated together with cartography in the same equation. Literature and mapping, on the one hand, and art and mapping, on the other, have already been discussed in bilateral configurations, but this conference attempts to place them side by side, and ideally to inaugurate a dialogue between the two, with the aim to encourage the articulation and confrontation of literary, artistic, and cartographic thinking. 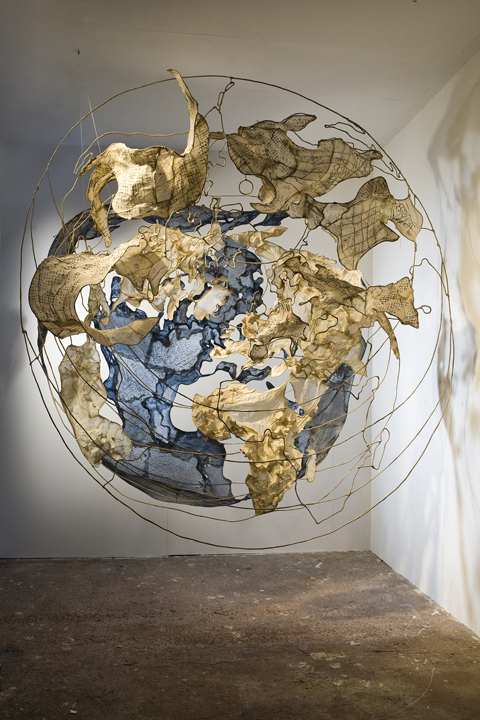 In the past decades there has been an ever-growing body of work on the intersections of literature, art, and geography (“the geohumanities” and “spatial turn”), and several exhibitions on “art and mapping”. The conference aims to draw on the conceptual foundations that have begun to coalesce around the figure of the map and to bring together these disciplinary strands. The conference would also like to offer an opportunity to reflect on the reasons for the explosion of the interest in maps and mapping in literary texts and artistic practice after World War II. Image: Eve Ingalls, Not Fitting, 2009.